8:04 PM: Good evening everyone! In less than hour, I will be reporting live to you from Philadelphia on this last debate between future-President Barack Obama and Senator John McCain. Some exciting news... I received my absentee ballot today, and like millions of other Americans across the country, have already voted for President! (Guess who I picked?) Tonight, I will be delivering more of that live color commentary you've come to know and love, breaking down the questions and letting you know what's really going on. Yesterday, John McCain vowed to "kick his you-know-what" and has also suggested he will be bringing up the "radical associations" he and his surrogates have not stopped talking about on the campaign trail. Will McCain finally "say it to my face," as Obama nearly taunted him to do? We will be watching out for that exchange, both to see if and how McCain brings it up, and what Obama has prepared to say to respond to it. All in all, it should make for good political theater. More importantly, we will be watching to see whose economic plans connect better with voters (both campaigns rolled out additional new policies this week). This is one of McCain's last chances to make up precious lost ground to Obama, so the stakes are perhaps higher than ever before. It should be a good show, so stay tuned! 9:00 The setting for this debate is both of them sitting close to each other at a table. This should create a very intimate and different feel from the first two debates. and here they come! 9:02: Doesn't Bob Schieffer kind of look like a zombie? John McCain looks uncomfortable already. 9:03: McCain's $52 billion plan versus Obama's $60 billion plan; why is one better than another? McCain always has thoughts and prayers for someone in the hospital; remember his kindly remarks for Ted Kennedy in the first debate? McCain is once again attempting to tie this entire economic collapse to Fannie and Freddie. This is very shortsighted, and not true, but he's doing it because of his claim that he was prescient on that single issue, despite being a lifelong deregulator. Obama's "fundamentals of the economy was weak" was a underhanded jab at John McCain, since everybody knows that was what he said on the first day of the meltdown a month ago today. On the CNN dial meter, we are once again seeing Obama scoring much higher on his specific proposals than McCain. Obama scored higher overall throughout the entire last debate; will we see that trend again in this debate? McCain is talking about Obama on taxes and hitting him hard, but it looks like people aren't buying it. Obama will contrast his tax plans with McCain's; as I've argued before, I think Obama is turning this normally negative area for Democrats into a positive. McCain is trying to raise the spectre of class warfare and keeps repeating this "spread the wealth around" meme. I wonder if it will get any traction? I do think McCain may have scored some points in this exchange. 9:14 Aren't you both ignoring reality? Haven't we heard this question already? McCain with the spending freeze, Obama with the scalpel, blah blah blah. Will we finally hear anything different? Obama's said this before; I will go through the budget line by line and cut programs. Interesting tidbit: Reagan said the same thing when he was running for President. He also thinks that investing in education, energy, etc. will give us the resources to do what we need. He is scoring high. McCain: talking about FDR's home ownership corporation. Energy independence. and here it comes... the spending freeze! "a hatchet, and then I would get out a scalpel!" Good line, Obama said that scalpel line twice, McCain makes up some ground there; his scores go way up on the voter meter. McCain brings up the overhead projector AGAIN! oy vey. Obama: not gonna abandon his scalpel line. Finally, Obama brings up the Bush budget albatross. There are some wild differences here between men and women on how they feel about what McCain is saying. Right now, Men are up in the sixties while women are down in the forties. How strange. McCain has got to fight hard to distinguish himself from President Bush; can that stick? What's interesting here is that they are finally having to listen to each other (well, McCain has to listen to Obama) and the intimacy of this setting is making this debate have a much less "speechy" character. They are actually following up much more carefully on each other's statements. 9:25: Hell of a question, Bob! Will you say these nasty things to each other face to face, what you've said on the campaign trail? McCain is dragging out this tired old discussion about town hall meetings. How can he possible blame Obama for the lies and smears his campaign has been promoting? It seems he's avoiding the worst of his own allegations, while bringing up this Wallace thing (that Obama, in fact, did repudiate). Interesting that he did not address the Ayers thing we have been expecting. Also, it seemed like McCain was genuinely hurt by what Congressman Lewis said. Obama: makes a smart move by saying, this guy is the negative one, I'm the one who's gonna focus on the issues. This is so interesting to see them looking at each other in the eye and talking about their own campaigns; its actually sort of surreal. 9:30 McCain is definitely having his finest night so far. I've got a feeling the news media is going to be scoring him a lot higher than any evening before. 9:33 Obama elevating the discussion; McCain starting to get testy and interrupt Barack Obama. Obama brings up "palling around with terrorists" line from Palin; McCain totally ignores it, and goes into a defense of his supporters. I wish Obama would just come back and say, "I'm not talking about your supporters, I'm talking about your running mate. How can you defend her dishonorable and dishonest comments?" Obama is trying to avoid the back and forth though, and instead once again focus on solving the issues. I think Obama is trying to take the high road and it is scoring him some points here and allowing him to bring the debate back to his side. 9:36 HERE IT IS! Ayers, ACORN, all the crap we knew was coming... Mr. Ayers indeed HAS become the centerpiece of McCain's campaign- finally getting to the heart of it. Obama is doing a fine job of working out the facts on this stuff, and now he's making a smart turn by talking about his positive associations. "it says more about your campaign, Mr. McCain, than it says about me." McCain is looking like so hypocritical; five minutes ago he said that Ayers was not important, and now he's working again to try and make those negative attacks hit. His numbers went soaring down during that little exchange. 9:40 The running mate question - love it! This is a gimmee for the Obama campaign; how will McCain possibly argue that Sarah Palin is more fit to be president than Joe Biden? I think this little pump up of Biden is a great little bit of wisdom on why the Biden pick was such a smart one: he'd make an outstanding president. McCain says the words Sarah Palin, and the positives plummet. He's trying to sell as her as this "breath of fresh air" reformer. Will Obama bring up the recent ethics report? The many lies of Sarah Palin? Will he put her in her place? Obama: refusing to go negative. Smart? Maybe. 9:49 I think these discussions about energy are so important and Obama is scoring great points on this. 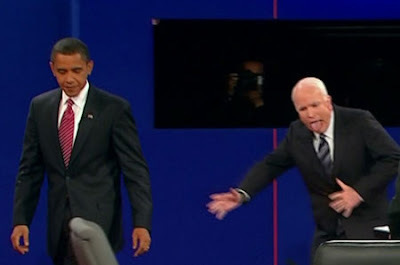 Watching McCain's reactions to Obama is very telling. He wears his heart on his sleeve; Obama looks cool as a cucumber. 9:53 Obama makes the excellent point that he is not against free trade; he is for free trade when the agreements are structured fairly and protect human and worker rights. A centrist and intelligent position, to which McCain must make a very loud SNIFF. McCain as Bush: "I don't do nuance." Obama's discussion about fuel efficient cars, clean energy is scoring the highest points of the night. After a weaker start, Obama seems to have hit his stride here. McCain says Obama wants to sit down with Hugo Chavez and look at Obama - he LAUGHS it off, because it is so ridiculous, and you know what? The dials from the indies seem to agree. People just don't buy these lies from the McCain campaign. Obama once again lays out his two pronged approach to Healthcare on lowering costs and getting more people insured. He once again gets into the details about how he's going to change things from the Bush/McCain Healthcare policies. McCain comes out with the standard boilerplate language about how terrible the healthcare crisis is. McCain keeps talking about these little fixes, but people don't buy it. McCain's talking to Joe the plumber again. Will Obama make you pay a fine? Yeah, if you're a huge multinational, not a small business! McCain looks STUNNED that Obama has an exemption for small businesses. It seems like on a lot of Obama's positions, McCain just doesn't know what he's talking about. He didn't seem to know about Obama's vote for the Chile free trade agreement, or this small business exemption. Obama criticizes McCain for taxing health care benefits for the first time (again) and McCain still has not responded to this attack. Will he tonight? 10:03 What is McCain talking about? Mandating health care? Big government at its best? McCain, where you listening to anything that Obama just said? Bizarre response here... and its not scoring high. People do not trust McCain on the healthcare issue, with good reason; for the last 8 years under Bush and the Republicans, they've been getting screwed. "Senator Government" says McCain. But maybe Americans are finally getting ready to trust Government again. It is very true that this election will be crucial for the composition of the Supreme Court. If you want more judges like Alito and Scalia, vote McCain for the erosion of civil liberties, the disregard for stare decisis, the overturning of Roe v. Wade, and the like. If you want more justices like Ginzburg and Breyer, elect Obama. 10:13 "if it sounds incredible, that's because it's not true." To which McCain once again gives us that stunned, befuddled, disrespectful look. As Obama explains his vote in Illinois on abortion, he continues to look smart, principled, and moderate. Its fascinating that McCain talks so much about bipartisanship, yet when Obama says there must be a way to find "common ground" on this issue, he gives out another one of his loud sniffs. Oh, and health of the mother? That's some crazy liberal batshit. 10:15 McCain is getting very testy again. As we approach the final 15 minutes here, it seems like he hasn't broken any new ground tonight. He is going to score better in this debate than the last two, but I predict Obama will still have an edge that at least mirrors his current edge in the national polls. If that is the case, I'd say McCain is looking more and more like toast. Obama is scoring in the 90s on this whole discussion on education. People really love how he is trying service to loans and making education not only a moral issue, but about the future of our economy and our future. McCain: choice and competition amongst schools is what works. This is part of the answer, John, but it is not the solution. It is also about resources. Why doesn't McCain have money for kids to go to college? Obama: "America's Youth aren't an interest group... they're our future!" McCain's strongest closing so far. Notice, his sell to independent's is "you can trust me," the implication being that Obama is risky and untrustworthy. Obama gives a typical closing speech focused on his ever-present theme: Change. CNN pundits are pretty good tonight. Reagan's guy makes a good point that it was McCain started out strong, and Obama was a little flat at time. Paul Begala agrees with me that the first 30 minutes were for McCain, but that Obama got his footing and was able to carry the last hour. David Gergen is absolutely right that once again, McCain lost his cool, and Obama kept looking presidential. CNN's voter panel goes for Obama almost 2 to 1. Over on Faux News, Charles Krauthammer is actually making an extremely good point... that on a day when the economy is down over 700 points, it wouldn't have mattered if Ronald Reagan himself had been sitting in that chair next to Obama... the fact is that McCain represents the opposing party, and this economic crisis has occurred on their watch. Obama just needed to show a steady, presidential air, and he did. Since he didn't make any major gaffes, no matter how well McCain tried, Obama came out the winner. Who did better in this debate?